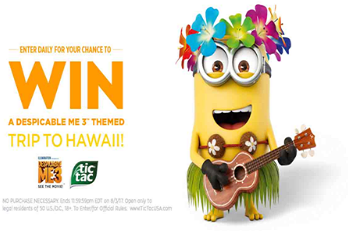 Despicable Me 3 – Tic Tac 2017 Sweepstakes – Win a trip to Hawaii! ENTER SWEEPSTAKES HERE – Tic Tac Sweepstakes page. ENTRY LIMIT – Limit one (1) entry per person and/or per email address per day during the Sweepstakes Period. ELIGIBILITY – The Sweepstakes is open only to legal residents of the fifty (50) United States and the District of Columbia who are eighteen (18) years of age or older at the time of entry. SWEEPSTAKES ENTRY PERIOD – Despicable Me 3™ – Tic Tac® 2017 Sweepstakes starts at 12:00:01 AM Eastern Time (“ET”) on May 4, 2017 and ends at 11:59:59 PM ET on August 3, 2017. 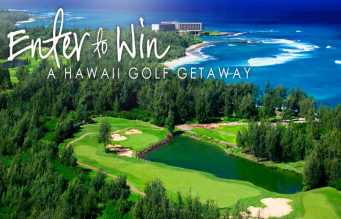 Turtle Bay Hawaii Golf Giveaway Sweepstakes – Win a stay at Turtle Bay Resort & more! Win a 5 night stay at Turtle Bay Resort & more (transportation not mentioned in prize)! ENTER SWEEPSTAKES HERE – Turtle Bay Sweepstakes page. ENTRY LIMIT – Limit: You may enter the Sweepstakes one (1) time and receive up to four (4) bonus entries during the Promotion Period, regardless of your method of entry. ELIGIBILITY – Participation open only to legal residents of the 50 United States, the District of Columbia or Puerto Rico, who are 18 or older as of date of entry. SWEEPSTAKES ENTRY PERIOD – Sweepstakes begins at 12:00:01am HST on February 1, 2016 and ends at 11:59:59pm HST on March 15, 2016 11:59:59pm. PRIZES – The prize: Five (5) night Premier Ocean View accommodation at Turtle Bay Resort, $1,000 Online $1,000 TravisMathew gift card, Unlimited Golf for two including (green fees, golf cart, Titelist rental clubs and balls at Turtle Bay Resort, welcome Turtle Bay Resort gift bag, Welcome dinner at Pa’akai, Surf Lessons for two, Horseback Trail Ride at Turtle Bay and backdoor pass to Surfer The Bar. 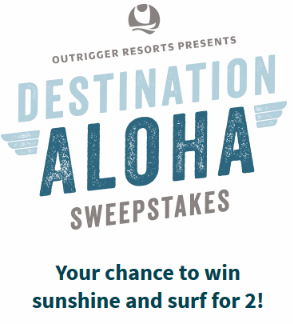 Outrigger Destination Aloha Sweepstakes – Win a trip to Honolulu! 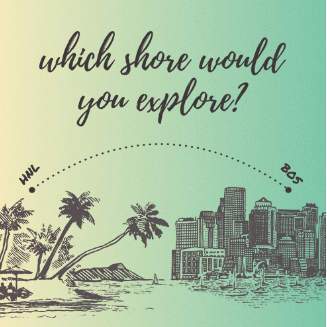 Win a trip to Honolulu! 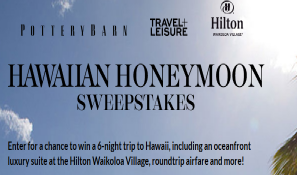 ENTER SWEEPSTAKES HERE – Outrigger Hotels Sweepstakes page. ENTRY LIMIT – Limit one (1) Subscription Entry or Mail Entry per person/e-mail. There is no limit as to how many Bonus Entries an entrant can receive. ELIGIBILITY – The Outrigger Destination Aloha Sweepstakes entrants must be legal residents of the fifty (50) United States and the District of Columbia, who are 18 years of age and have online access as of the date of entry, unless state or local law prohibits entry or requires pre-registration or bonding. Entrants must also have either a valid social security number and/or a valid personal tax identification number. SWEEPSTAKES ENTRY PERIOD – This Sweepstakes begins at 12:00:01 AM HST on October 13, 2015 and ends at 11:59:59 PM HST on November 20, 2015. PRIZES – There will be one (1) prize awarded consisting of a trip for Winner and one (1) guest to Honolulu, Hawaii. Trip will include: (a) round trip coach-class/economy air transportation for Prize Winner and one (1) Guest from a major commercial airport near Winner’s residence (as determined by Sponsor in its sole discretion) to a major commercial airport near Honolulu, Hawaii (as determined by Sponsor in its sole discretion); (b) a certificate for five (5) nights standard hotel accommodations (two  city view rooms, double occupancy) at Outrigger Waikiki Beach Resort in Honolulu, Hawaii; (c) a gift card in the amount of $200 U.S. redeemable at Infinity Sap; (d) and a gift card in the amount of $200 U.S. redeemable at Hula Grill Waikiki restaurant. Approximate Retail Value (“ARV”) of the Prize: $4,845 U.S.
SanDisk #TravelStick Sweepstakes – Win 140,000 HawaiianMiles & more! 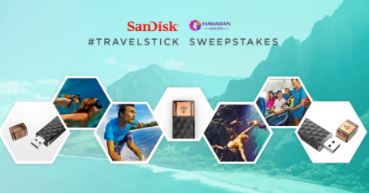 Win 140,000 HawaiianMiles and a 32GB SanDisk Connect Wireless Stick! ENTER SWEEPSTAKES HERE – Sandisk Sweepstakes page. ELIGIBILITY – The Promotion is open only to legal residents of the fifty (50) United States and the District of Columbia (excluding residents of Puerto Rico and all other U.S. territories and possessions) who are at least 18 and have attained the legal age of majority in their state of residence at the time of entry and at the time the prize is awarded. SWEEPSTAKES ENTRY PERIOD – The Promotion begins on August 1, 2015 at 12:00 AM PST (Pacific Standard Time) and ends on Aug 31, 2015 at 11:59 PM PST (Pacific Standard Time). PRIZES – Grand Prize (1): 140,000 HawaiianMiles, $1,400 ARV and one (1) 32GB SanDisk Connect™ Wireless Stick $39.99 ARV. Miles can be redeemed from Hawaiian Airlines for a round-trip for two between any of Hawaiian Airlines’ North American gateway cities and Hawaii and are subject to Specific Grand Prize Restrictions . First Prize (50): One (1) 32GB SanDisk Connect Wireless Stick, $39.99 ARV. New Day’s 2015 Escape to Aulani Sweepstakes – Win a trip to Disney’s Hawaiian Resort! Win a trip to Disney’s Aulani Resort & Spa in Hawaii! ENTER SWEEPSTAKES HERE – King 5’s New Day Sweepstakes page. ENTRY LIMIT – Entries limited to one (1) per person for the duration of the Sweepstakes. When your entry has been received you will be sent a special link that you can share with friends to get bonus entries. You will get five (5) bonus entries for each friend who enters using the unique link provided. ELIGIBILITY – New Day’s Escape to Aulani Sweepstakes is open to legal U.S. residents of the State of Washington who are 18 years or older. SWEEPSTAKES PERIOD – The Sweepstakes will begin at 11AM PT on March 16, 2015 and end at 12PM (noon) PT March 30, 2015. PRIZES – One (1) Grand Prize Winner will receive a prize package for up to four (4) people including: Up to four (4) round trip coach airfares between the Seattle International Airport and the Honolulu International airport (each as determined solely by Disney, with possible layovers). A voucher for up to four (4) round-trip ground transfers between the Honolulu International airport and the Resort. Room accommodations consisting of one (1) standard room (with a maximum of four (4) persons per room) for four (4) nights at the Resort (as selected by Disney in its sole determination). $200 Resort spending credit valid at Aulani, A Disney Resort and Spa during travel dates. The estimated retail value of each Vacation Package is four thousand six-hundred and fifty dollar ($4,650.00). 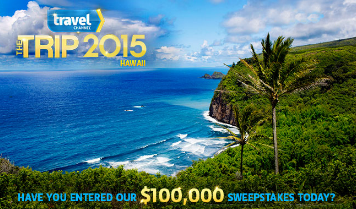 Travel Channel’s “The Trip: 2015” Sweepstakes – Win a trip to Hawaii! Win a trip to Hawaii worth $100,000! ENTRY LIMIT – Limit of one (1) entry per eligible person, per day via the Website and one (1) entry per eligible person, per day via the Facebook Page, during the Promotion Period. SWEEPSTAKES PERIOD – Sweepstakes begins at 12:00 p.m. Eastern Time (“ET”) on January 2, 2015 and ends at 11:59 p.m. ET on March 24, 2015. PRIZES – The Grand Prize Winner shall receive the following: a trip for two (2) to Maui, HI, which includes: (i) round-trip First Class air transportation for Grand Prize Winner and guest between the major U.S. airport nearest Grand Prize Winner’s residence and Maui, HI (airports determined by Sponsor in its sole discretion); (ii) fourteen (14) nights/fifteen (15) days hotel accommodations (one room, double occupancy, room rate and tax only) throughout the Hawaiian Islands (four (4) nights in Maui, three (3) nights in Kauai, three (3) nights in Lanai, and four (4) nights in Oahu); (iii) island hopper flights between islands; (iv) acrobatic ride and air tour of Oahu in a 1940’s Stearman biplane; (v) private Napali kayak tour; (vi) private tour of Pearl Harbor; (vii) private tour of the Honolulu Fish Auction including breaking down a giant ahi tuna; (viii) scuba dive or snorkel through the “Cathedrals” of Lanai; (ix) private helicopter tour of the volcanoes including a hike through Hawaii Volcanoes National Park; (x) rappel alongside a waterfall in Maui; (xi) zipline excursion at Piiholo Ranch; (xii) helicopter tour of Manawaiopuna Falls; (xiii) VIP Dining at Alan Wong’s; (xiv) day out with chef Mark Noguchi; (xv) mixology lesson at Pint & Jigger pop up bar; (xvi) one (1) day motorcycle rental and riding tour in Kona; (xvii) tour at Volcano Winery; (xviii) private boat excursion including an ocean water swim with wild dolphins; (xix) tour of Kahua Ranch and ATV adventure; (xxi) $25,000 spending money; and (xxii) luxury car rental for the duration of stay. Approximate retail value (“ARV”) of the Grand Prize is $100,000. In lieu of receiving the Grand Prize trip package, the Grand Prize Winner may elect to receive Seventy-Five Thousand dollars ($75,000) (awarded in the form of a check) (the “Grand Prize Cash Option”). The Total ARV of the Grand Prize Cash Option is $75,000. 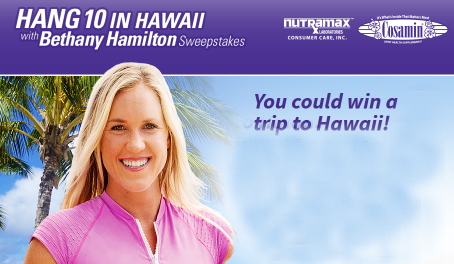 Cosamin Hang 10 in Hawaii with Bethany Hamilton Sweepstakes – Win a trip to Kauai! Win a trip for 2 to Kauai, Hawaii! ENTER SWEEPSTAKES HERE – Cosamin Sweepstakes page. ENTRY LIMIT – The limit is one (1) entry per person per day during the entire Sweepstakes Period. ELIGIBILITY – This Sweepstakes is offered only to legal residents of the fifty (50) U.S. States and the District of Columbia who are eighteen (18) years and older at the time of entry. SWEEPSTAKES PERIOD – The Sweepstakes begins on November 24, 2014, at 12:00 P.M. Eastern Time (“ET”) and ends on December 21, 2014, at 11:59:59 P.M. ET. PRIZES – Grand Prize (1): The Grand Prize Winner will receive a three (3) day/two (2) night trip for two (2) people (winner and one  guest) to Kauai, Hawaii. The Grand Prize includes round-trip coach class air transportation from a major commercial airport near Grand Prize Winner’s residence to Kauai, Hawaii for Grand Prize Winner and one (1) guest (departure and arrival airports selected by Sponsor at its sole discretion); two (2) nights hotel standard accommodations at a local hotel (single room/double occupancy); a surfing experience with Bethany Hamilton (subject to availability), and a check for $900 payable to the Grand Prize Winner. Grand Prize trip must be taken between February 9, 2015 and February 12, 2015. Grand Prize ARV: $7,000. First Prizes (25): Each First Prize Winner will receive a copy of the book “Body & Soul” by Bethany Hamilton signed by Bethany Hamilton. Twenty-five (25) First Prizes will be available in the Sweepstakes. ARV of each First Prize: $20. 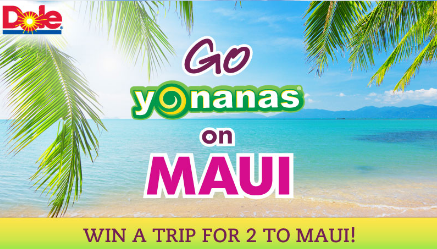 Go Yonanas on Maui Sweepstakes – Win a trip for 2 to Maui! ENTRY LIMIT – Limit one (1) entry per person per day for completing a Sweepstakes entry form during the Sweepstakes Submission Period. ELIGIBILITY – The Sweepstakes is open only to natural persons who are permanent legal residents of the fifty (50) United States, District of Columbia or any provinces of Canada, who are physically located and residing therein and who are at least eighteen (18) years of age or older at the time of entry. SWEEPSTAKES PERIOD – Sweepstakes submission period begins on Saturday, November 8, 2014, at 12:00 a.m. Eastern Time (“ET”) and ends on Sunday, December 21, 2014, at 11:59 p.m. ET. PRIZES – One (1) Prize winner will receive a trip for two (2) to Maui, Hawaii between March 1, 2015, and January 31, 2016, for the Prize winner and one (1) eligible travel companion (“Prize”). The Prize will include: (i) roundtrip economy class airfare for two (2) inclusive of taxes from winner’s nearest gateway city in North America including ATL, DEN, DFW, EWR, IAH, JFK, LAX, OAK, ORD, PDX, PHL, SAN, SEA, SFO, SJC, SLC, YYZ, or YVR to Kahului Airport or an alternative airport selected by Prize Provider; (ii) five (5) consecutive nights hotel accommodations (single standard room, double occupancy, room and tax only) at the Napili Kai Beach Resort on Maui with complimentary Wi-Fi access; (iii) daily breakfast for two (2); and (iv) an Outrigger Canoe Trip for two (2). The approximate retail value (“ARV”) of the Prize is four thousand three hundred forty-five dollars (USD $4,345.00).